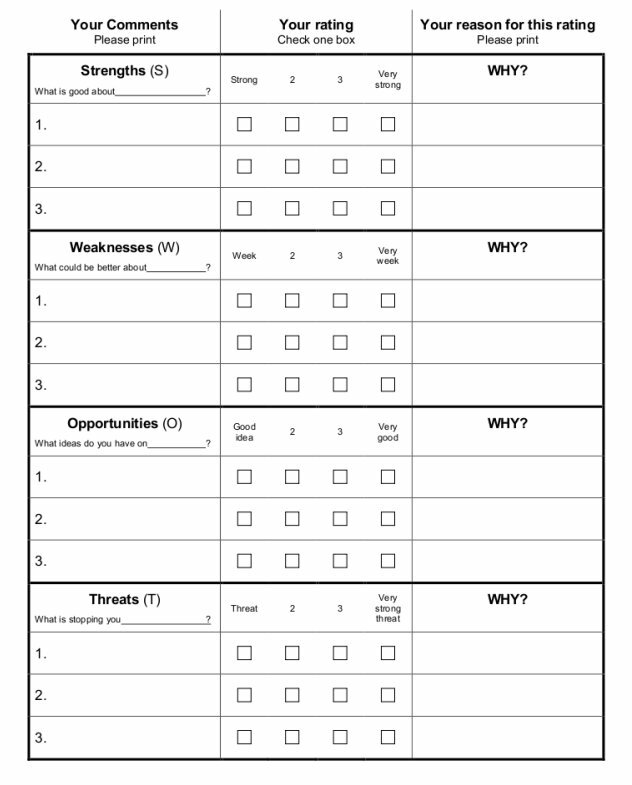 The SWOT is a simple tool to analyse your uniqueness and your burning platform. It is also an excellent research tool for collecting feedback or views on a specific topic. SWOT stands for Strengths, Weaknesses, Opportunities and Threats. It can be used in a face-to-face interview or small group discussion, or as a paper questionnaire. It’s also ideal for a quick telephone survey. Demonstrated listening and helps you to internally market changes you implement as a result of the feedback. The questionnaire normally takes around 15 minutes to complete. Ask each of the four questions in turn and then ask for the scores before you move on to the next question. Ask why they have given the score and write down these comments. The results of the analysis will form the basis for an action plan to address the issues you have uncovered.